VANGUARD newspapers have thrown caution to the wind, accepting to publish falsehood and mislead the gullible. It is heartbreaking when these lies are targeted at indigenous people of Biafra or directed to the leader Mazi Nnamdi Kanu. Mazi Nnamdi kanu has been unjustly detained against his wish by Islamic government of Nigeria for asking for freedom of his people from Nigeria. Vanguard has also eaten the forbidden carrots Buhari dangled before all media outfits in that evil forest called Nigeria. This is to blackmail Biafra and leader Nnamdi Kanu and if possible discourage those working for Biafra restoration.. They are playing the role of Balaam who for filthy lucre tried to curse those chosen by heaven or stop them access to Canaan land. Vanguard is disillusioned and has resorted to lies and cheap propaganda. The brand lack professionalism and credibility. They have compromised their integrity because of Buhari’s brown envelope. 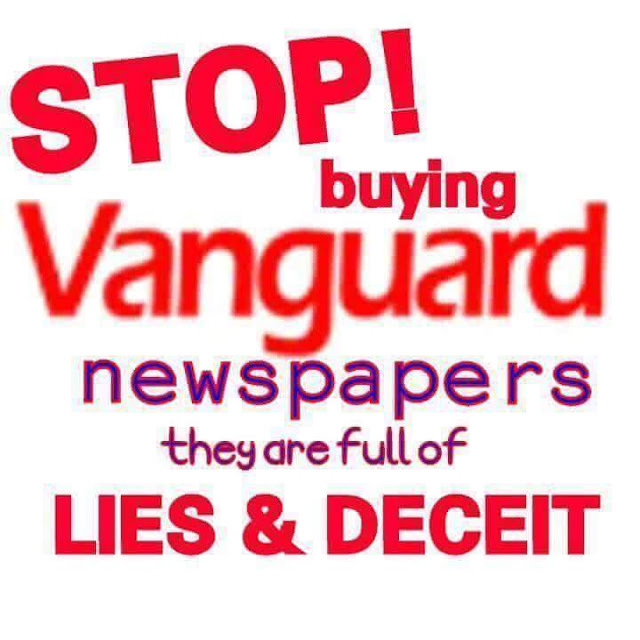 Any sane Biafra should never buy falsehood called vanguard newspapers. Blinded to truth and investigative journalism they have lost faith in themselves as are now laying discordant tunes. Because vanguard has digressed and migrated away from light of knowledge to darkness of ignorance, it has been verily uneasy for them to briddle their idiocy. They chose to satisfy their lust, compromising and ate the dividend of Nigeria corruption ridden government. Its evident that their whole activities lack sense of proportion. This has resulted to squabble for relevance seen in their disjointed stories and misrepresentation of indigenous people of Biafra or irrelevant attachment of Nnamdi kanu hallowed name to their polluted writings. Vanguard scrambling for crumbs from Buhari table has lend sympathy to murderers of our people. The whole world is seeing and recording their under reportage of the inhuman crimes committed against Biafra, When will vanguard report the over fifteen assaination attempt on Nnamdi kanu? Nigeria media has been afflicted with scourge of corruption and vanguard deeply affected.